Join this breathtaking journey to four of Southeast Asia’s most intriguing destinations, each with their own world class attractions. Admire the breathtaking scenery of Halong Bay and its extraordinary limestone pinnacles, the tree-lined boulevards and colonial villas of Hanoi and vibrant Saigon. Marvel at the extraordinary ancient temples of Angkor and the sleepy pace of Luang Prabang. The adventure culminates in buzzing Bangkok where you’ll soak up the river views at your landmark hotel. At every turn you’ll enjoy the fresh flavours of the subtly spiced local cuisine and be warmly welcomed by some of the most friendly folk on the planet. Arrive in Hanoi, the capital of Vietnam, and transfer to your iconic colonial-style hotel. Hanoi is the country’s cultural heart, bearing traces of centuries of changing dynasties. Visit Ho Chi Minh’s house, a simple structure that served as home to the revolutionary guerrilla leader. Continue to the lotus-shaped One Pillar Pagoda, dating back to the first independent Vietnamese empire. Also visit the infamous “Hanoi Hilton”, where American prisoners of war were once incarcerated. Ride like a local by cyclo through the city’s Old Quarter. This evening, gather with your fellow guests for a welcome dinner. Recently experiencing a resurgence of art and culture, Ho Chi Minh City is a lively, evocative hub of activity. Today, view examples of the city’s colonial legacy, including the Reunification Palace and the Central Post Office, and stop for photos at the Cathedral of Notre Dame and the Saigon Opera House. After lunch at a local restaurant, visit the War Remnants Museum, to discover photographs from Bunyo Ishikawa, a Vietnam War photojournalist. Then, get a feel for present-day Vietnamese life as you stroll through Ben Thanh Market. Tonight, gather with your fellow guests for dinner at a local culinary hot spot. Fly to Siem Reap, the town nearest to Angkor Thom and Angkor Wat, and enjoy lunch at a local restaurant upon arrival. Then, begin your exploration of Angkor Thom, the last capital of the Khmer kingdom, with a visit to the Bayon Temple, with its 172 large-scale faces bearing beguiling smiles, representing gods, goddesses and other beings from classical poems and mythology. Check in to your hotel before gathering for dinner at a local restaurant. Rise early this morning to experience the incomparable serenity and inspiration of watching the sun rise over mystical Angkor Wat. Return to your hotel for breakfast and a morning at leisure. Later this afternoon, discover the stunning ruins of Ta Prohm, where the roots of great trees seem to have spilled over the roof of this iconic stone temple. Enjoy a scenic sundowner on a gondola while floating on the Angkor Thom moat. Today, explore a less-visited temple — the 10th century pink sandstone Banteay Srei, known as the “Citadel of Women.” Learn about the essential work of the Cambodia Clean Water Project, an A&K Philanthropy project that builds pumping wells in rural communities throughout the country. Enjoy lunch at a local restaurant before visiting the Angkor National Museum, home to golden-era Khmer kingdom artifacts. 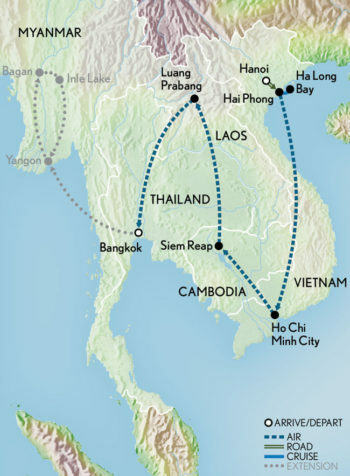 Then, bid farewell to Cambodia as you fly to Luang Prabang, Laos. Step back in time for a day. This morning, join in a village baci ceremony, and then proceed to Wat Xieng Thong, a Buddhist Temple noted for its “Tree of Life” wall mosaic. After lunch at a local restaurant, stop at the Traditional Arts & Ethnology Centre, which is devoted to protecting the ethnic diversity of Laos. In the evening, enjoy a stroll through the vibrant night market before continuing to a top local restaurant for dinner. Rise very early to witness the solemn procession of local monks in their saffron robes and offer them alms before returning to the hotel for breakfast. Next, visit the National Museum, once a royal palace, before continuing to a local restaurant for lunch. Visit a silk weaving centre and then fly to Bangkok, Thailand’s vibrant capital. After breakfast, transfer to the airport for onward flight arrangements. Please note: The 14 April 2019 departure operates with slightly revised routing. Please contact A&K for details.